A costumed and masked character smiles into the camera beside the Grand Canal in Venice, Italy. Carnival season in Venice is an annual event and people dress in these elaborate costumes and masks and party in this city on water. 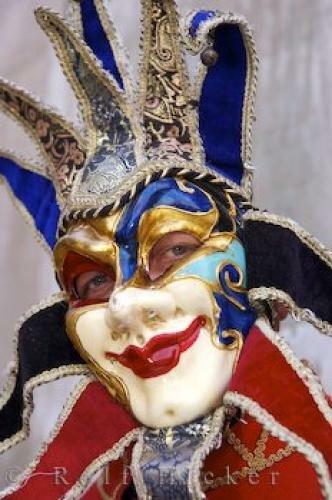 A costumed and masked character smiles into the camera as he stands beside the Grand Canal in Venice, Italy; during Carnival in Venice, characters like this can be seen all over the city and visitors come from all over the world to see the famous masks and costumes of this unique city. Carnival in Venice was first recorded in 1268, and masks have always been a central part of the festival, but also of city life itself. There are specialized mask shops all over Venice that tourists can buy their own masks from to take home, and the shop that made the masks from the Tom Cruise film 'Eyes Wide Shut' is also located in Venice and is a popular draw for tourists. beside the Grand Canal in Venice, Veneto, Italy. ... A modern mask shop was discovered in the 1980s and it wasn't until then that carnival was given a revival and became a popular activity once again. Carnival with masks and costumes have always been a part of the city culture, but have not always been allowed to be celebrated. Carnival starts about two weeks before Ash Wednesday and lasts for about two weeks, before it ends on Shrove Tuesday, which is the day before Ash Wednesday. There are different activities every day for the two weeks, but the main focus of the event are the masks and costumes. Costumed and masked characters beside the Grand Canal in Venice, Veneto, Italy, Europe. I photographed this photo with the digital SLR camera model Canon EOS-1Ds Mark II, aperture of f/5.0, exposure time of 1/60 sec. on ISO 100, as always I used a original Canon Lens, the focus lenght for this picture was 62mm.